Murderbot, the gruff yet lovable, media obsessed Security AI is back in Rogue Protocol, the latest tale in Martha Wells’ The Murderbot Diaries, a Tor.com series of novellas. In the first story, the Nebula Award winning All Systems Red, Murderbot, a self-nicknamed security robot, secretly hacks into its governor module and gains its freedom from its human contracts. Other than enjoying entertainment media, its goal is to recall a lapse in its memory regarding the night its prior contracts were all killed, and the mystery surrounding that night. Eventually venturing out on its own, the story continues in Artificial Condition with Murderbot planning to travel to the site of the massacre. Enlisting the help of ART, a funny and sardonic transport vessel who gives Murderbot sass as much as it takes it back from Murderbot, the two travel together in an odd couple scenario before Murderbot is dragged into helping another set of humans. This time around, Murderbot is continuing its journey toward discovering what happened the night its human contracts were all murdered. Posing as a security consultant and problem solver for a group of humans, the rogue SecUnit finds itself on the site of an abandoned terraforming project once run by GrayCris, the mysterious organization which may have something to do with the murder. Undercover and bothered at having to put its media passion on hold, Murderbot explores its new surroundings for clues. When I called it a pet robot, I honestly thought I was exaggerating. This was going to be even more annoying than I had anticipated, and I had anticipated a pretty high level of annoyance, maybe as high as 85 percent. Now I was looking at 90 percent, possibly 95 percent. Oh, Murderbot, what did you do? 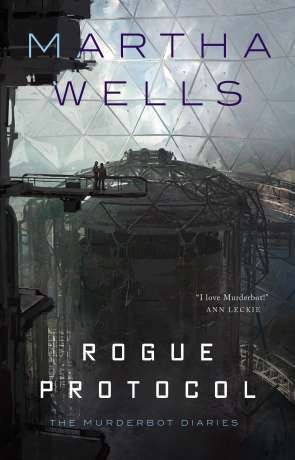 As with Murderbot and its feelings toward humans and other things outside of its entertainment media world, once Wells has her hooks into the reader, they truly cannot stop caring about the rogue and sarcastic AI. Written on 1st October 2018 by Michael Feeney.